I grew up here on the Texas Gulf Coast. Fishing was really all my brother and I knew to do on the weekends growing up. Dad would work all week, and most Friday evenings was spent loading the boat up, getting reels re-spooled, double checking everything and anticipating Dad coming in our rooms and waking us up “Rise and Shine Boys – Time to go Fishing!” We loved it. Dad loved it. Mom loved it! It was just what our family did. When I say we would spend the entire day on Galveston Bay… I mean the entire day! There are so many great things that make up a day of fishing with your family. We not only learned how to fish… There were so many other things that Dad taught us to go along with fishing. How to drive a boat. How to back up a trailer. How to charge a battery. How to change a battery. How to fix trailer lights. How to pack wheel bearings. How to clean fish. Boating safety. Bird Identification. Boating etiquette. The list could go on and on. As I have taken fishing to another level than my Dad did – I still try to teach kids things other that ‘fishing’ in the short time I have to spend with them on a half day charter. 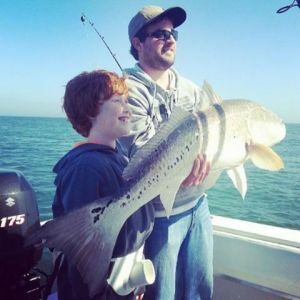 Some neat things we try to do on our Galveston Family Fishing Charters is knot tying, fish i.d., casting, how to bait hooks, how to measure fish, regulations, and more. Family Fishing in Galveston is so great 12 months out of the year. We cater our Galveston Fishing Charters to fish for what is biting. 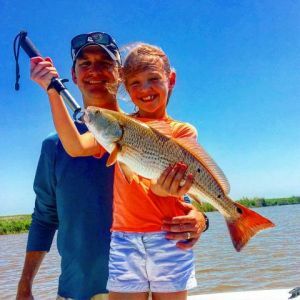 Spawning seasons, water temps, and weather conditions, are three important factors to consider when our Family Friendly Fishing Guides decide what location to fish, type of baits, and what species to target. On every, single fishing trip we run – our goals is to catch fish! Bent poles put smiles on Kid’s faces…. And in turn – Mom and Dad’s smile! We offer many types of trips that are hits for all families. Bays and Marshes are great for anyone that may be prone to motion sickness. 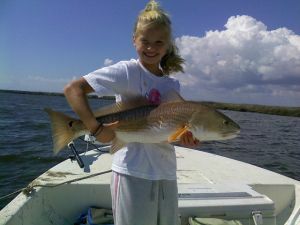 These are the same areas we have our Galveston Summer Kids Fishing Camps, and are extremely kid friendly! Also, our Galveston Shark Fishing Trips are always a hit after the beloved ‘Shark Week’ on TV! Jetties and beachfront trips offer a great trip for a wide variety of fish. Night Time Flounder Gigging is also a cool trip that excites kids of all ages. We have actually had many ‘Fishing Birthday Parties’ for kids! Another great addition we recently added for our customers is water front lodging, and our boat can pick you up from the dock of the lodge! Check out more lodging details here. Give us a call, and Captain Greg will be happy to answer any questions, and let you know what type of trip will be best for your family! 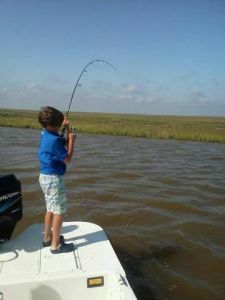 Galveston Family Fishing Trips are our specialty!